work collaboratively to plan, construct, write and/or orally present, and explain alternative viewpoints in the interpretation of the content of the video clip. draw on and extrapolate from their learning to carry out appropriate wider research and to construct a written, balanced, argumentative report relevant to contemporary Australian society. Examine the sequence of the video clip involving the observations of David Collins. Using this as an example, work in pairs to write descriptions and explanations of a particular activity, such as a ritual dance or enactment, and witnessed for the first time by Europeans. One record should be written or orally narrated from an indigenous viewpoint, while the other should be presented from the European perspective. Provide an account to the class of the differences in interpretation between the two records. The class may also be invited to discuss the reasons for the differences, and to expand upon the content of the two records. 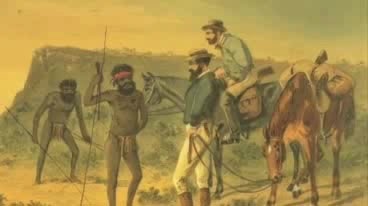 Do you think new immigrants to Australia today should be compulsorily educated about the history of first contact of immigrant cultures with the indigenous populace of 1788? Carry out appropriate research then plan and write a reasoned report either in favour or against the proposition, for a government committee appointed to oversee the functions and management of immigration programs.